We get so many questions on maintenance for pop up campers, that we put together this little series. 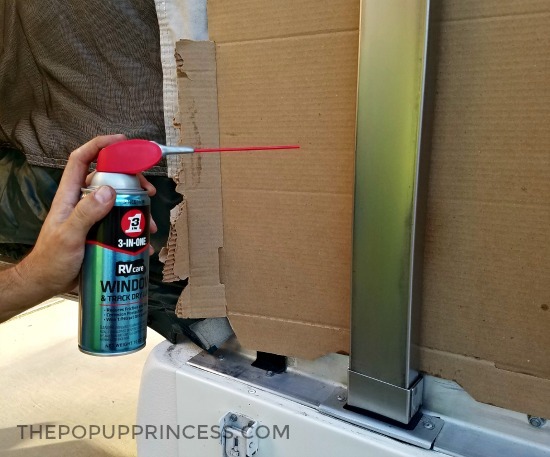 A few weeks ago, we talked all about how we spring clean the exterior of our PUP. We tackled exterior maintenance items like canvas care, battery maintenance, and trailer bearings. If you missed that post, you can find it here. We usually do a quick wipe down of the interior of all the canvas once a year. When we first got the camper, we did a major scrub-down with Woolite and water, and the interior stays pretty clean all year. Once a year, though, I like to give it a wipe down with 303 Multi Surface Cleaner just to keep it looking great and prevent dirt from building up. We sometimes get black marks on the canvas from the bed tracks, and the Multi Surface Cleaner does a good job of removing those. I just spray it on, then wipe it off with a damp rag. 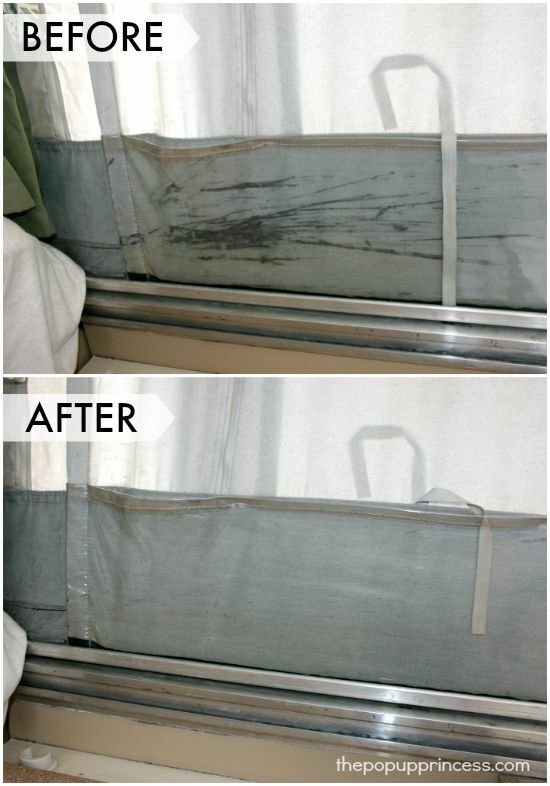 Once the canvas is all dry, we treat the exterior-facing window flaps. They will be exposed to the elements, so we make sure they have a good coat of 303 High Tech Fabric Guard to keep the moisture at bay. 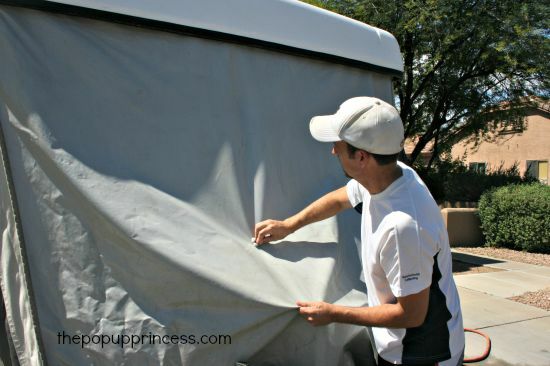 We cover our mattresses with cheap waterproof covers–I got ours at Walmart–and lay an absorbent towel underneath the window. Then we unzip the flap and lay it across the towel. You can treat the canvas flap just like you treated the exterior. We spray 303 High Tech Fabric Guard on in overlapping bursts. There is really no need to waterproof the interior of the canvas. If you’ve done a good job waterproofing the exterior, you should have nothing to worry about. 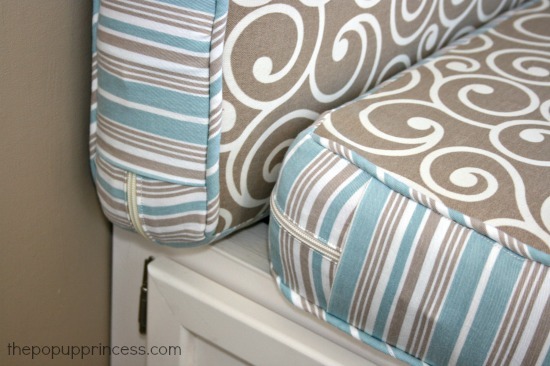 When I made my curtains and cushion covers, I knew I wanted them to be removable so I could easily take them off and wash them. Those wrap around zippers on my cushions are the bomb, I tell ya! 😉 Every year I remove the cushion covers, curtains, and valances and give them a wash in my machine on the gentle cycle. I always line dry them so they won’t shrink and the heat won’t damage the black out lining. Sometimes I need a little help getting the wrinkles out, though, and I’ve found that if I set my iron on a cooler setting, it gets them neatly pressed without damaging anything. Because we often have issues with my kids dropping food on the cushions or spitting toothpaste on the curtains, I treat everything with a stain guard. I have never been disappointed with the 303 Products I have tried. 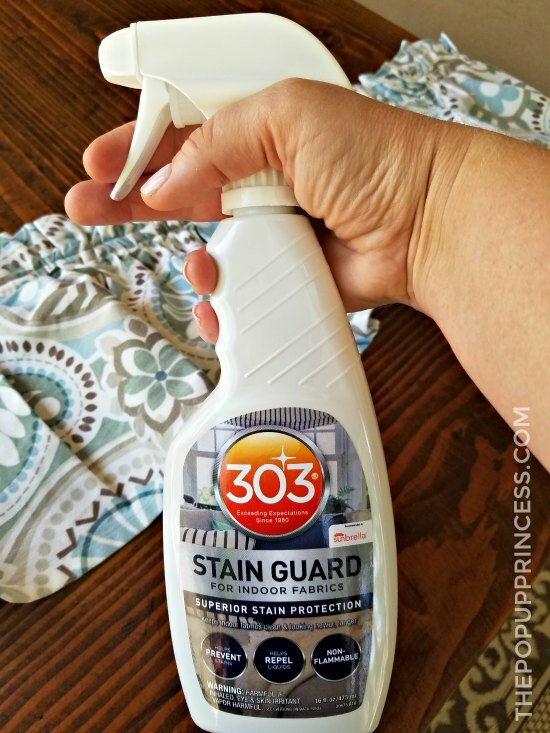 I had recently used this 303 Stain Guard on my newly upholstered dining room chairs with good results, so I decided to give their Stain Guard inside the camper. It is amazing. No more toothpaste stains, and I can wipe things clean easily. I’m sure Scotch Guard or something similar would work well, too. We wash the bedding after every trip. If we are on a long trip, we will wash it a couple times at camp, too. During spring cleaning, however, I go a little further. 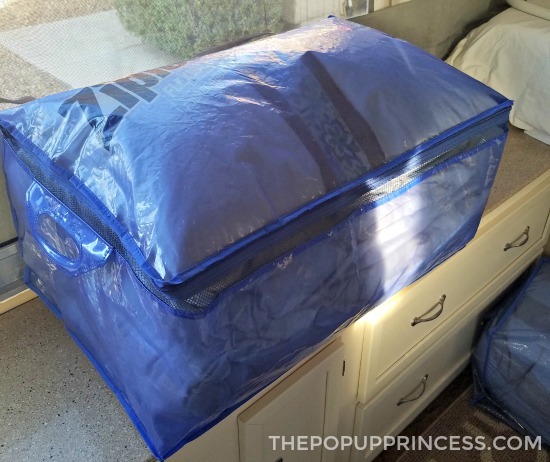 I make sure all the bedding is clean (including duvet inserts) and fold it all up to store it in these huge Ziploc flexible totes on the floor of the camper. Each bed gets a bag, and I store sheets, comforters, and pillows for the bed all in one bag. The totes have a zipper closures, which work great for getting things in and out easily. I stuff a few dryer sheets in with the bedding, and when we are ready to use it, everything smells fresh and clean. When they aren’t holding bedding, I can store the empty totes in a corner cabinet of the camper, and they don’t take up much space at all. We clean the cassette toilet after every trip, but once a year we really get in there and deep clean everything. We clean out the holding tank well and remove the emptying spout to make sure we clean every corner. Then we clean the exterior and bowl with Thetford Aqua-Clean, which is safe for the seal. ou want to make sure whatever product you use to clean the toilet is safe for the seals and the plastic. When we first got the camper, the valve blade in our cassette toilet would stick when we tried to open it. After a few treatments of seal conditioner (we like Thetford Toilet Seal), it was working perfectly again. 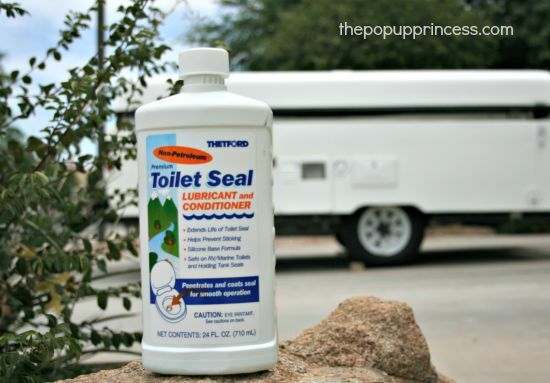 At least once a year, we use Toilet Seal to recondition the seal and make sure everything opens smoothly. 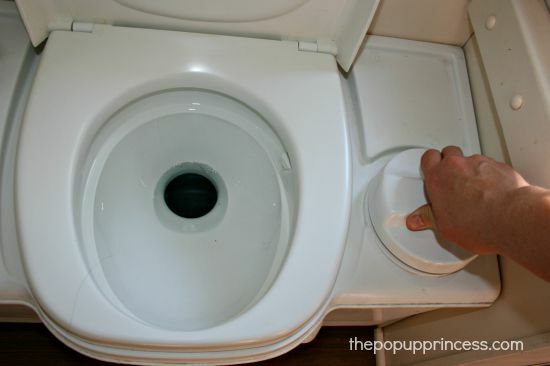 If you want to learn more about how we maintain our cassette toilet, you can check out this post we wrote for all the details. We lubricate the lift arms and bed tracks while we are spring cleaning. I listed this with our inside process, but the lift arms are actually lubricated from the outside of the camper. We usually place a piece of cardboard behind each post to protect the canvas and spray a little silicone spray or dry grease along the arm. We like silicone or dry lubricating spray because it doesn’t attract dirt, and it dries clear, so it doesn’t leave grease behind on your canvas. This same lubricant is what we use on the inside of the bed tracks, and it helps them glide in and out easier. 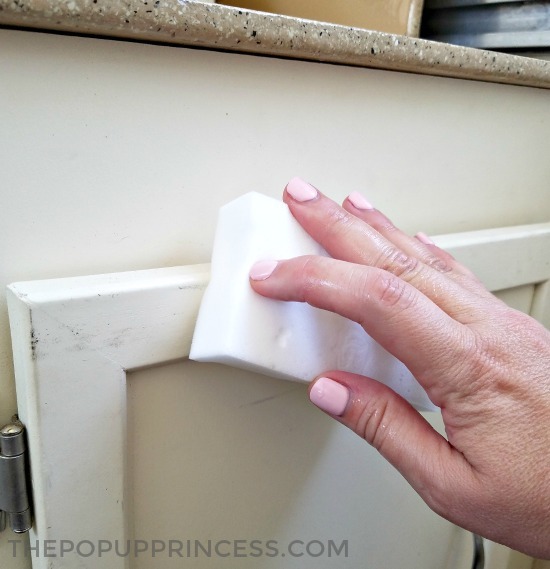 Our white cabinets have held up really well over the past few years (you can read all about that here), but they do need to be deep cleaned once a year, and spring cleaning is the perfect time to do it. I can usually just take a damp Magic Eraser to them to wipe them clean. In fact, after a few swipes of the Magic Eraser, they look brand new again. 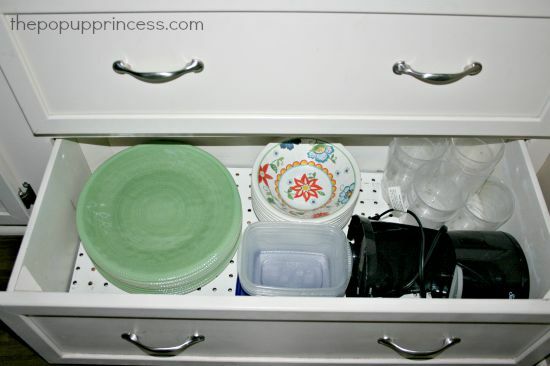 While I am cleaning the cabinets, I always take this opportunity to run all the dinnerware and utensils through my dishwasher and pack them back in their drawers. We do dishes at camp, but I like to make sure my dishes get run through the dishwasher on a hot cycle every now and again. 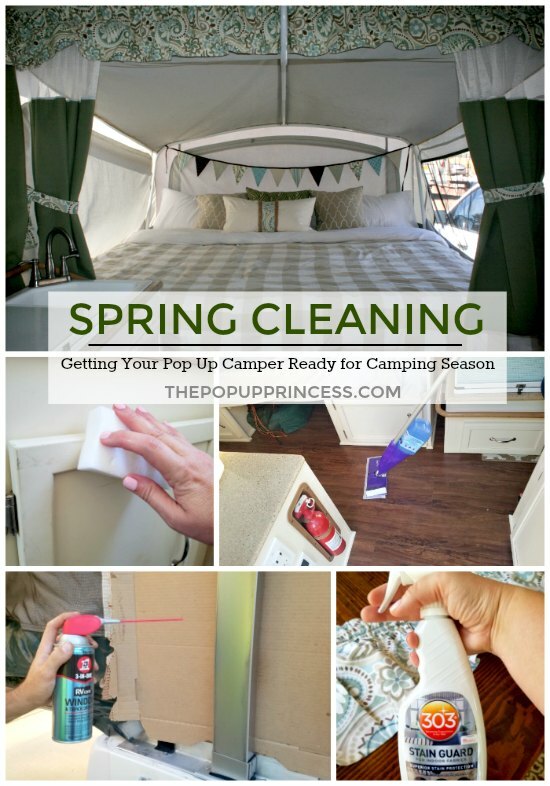 😀 If you’d like to see how we organize our camper and what stays in it year-round, check out this post. Once my cabinets are all clean, I move to the floors. 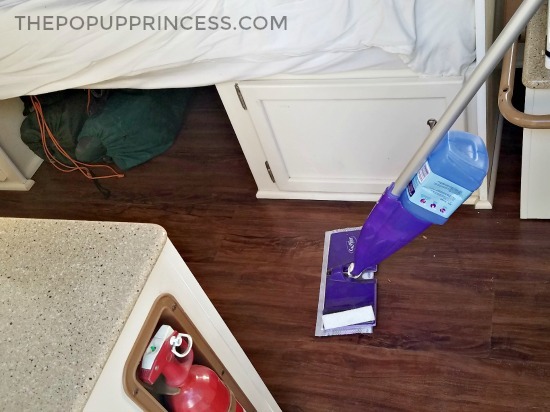 We have inexpensive area rugs scattered throughout the camper, so those hit the washing machine at least once a year–usually much, much more than once a year. 😆 While I am waiting for those to wash, I pull out my Swiffer WetJet and mop the floors. I also try to give the fridge a good scrub-down, too. Then I replace all my rugs and call it good. Once those interior things are all taken care of, my pop up camper is ready to hit the road. And… by the time we’ve finished all that maintenance, we are ready to hit the road, too. 😉 It does take a little bit of work to get the camper ready for the season, but it is so worth it. Proper maintenance will keep your camper in top shape, and by going through everything thoroughly, you can stave off any potential problems, too. That wraps up our segment on spring cleaning. What is on your spring cleaning list? See anything we missed? Feel free to comment below or leave us a comment on Facebook. I love it! We bought our camper used last year! I am just starting to understand how to clean everything. I want to redo the inside, new curtains, flooring, etc. Thank you for your posts it has helped me a lot!!!!! I love your curtains btw!!! We bought a used Coleman popup last summer and hit the road. We leave for our trip this year in 2 weeks…there’s this smell that’s been there since we got it that drives me nuts though! Maybe from the plastic windows? Just being sealed up for long periods of time? Old foam cushions? Any idea what it could be? How can I get it to smell fresh&crisp&clean when we open it up? I’m inspired by your spring cleaning post…got a lot of prep to do! Any ideas? If your PUP has a musty smell, it could be mold or mildew. In that case, you’ll want to make sure all your fabrics are super clean. I’ve heard people have great success with sprinkling baking soda on the cushions, leaving them for a few days, and vacuuming them clean. Did you replace the cushion covers? Any suggestions for the underside of the vinyl? We have mildew stains on ours. 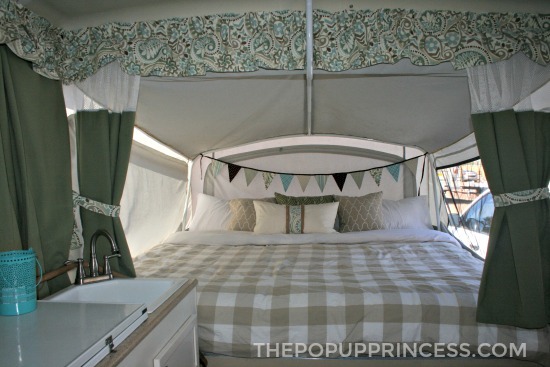 Is it easy to remove the tenting to clean off of the pop up? What do you use to clean the interior side of your canvas? We love 303 Multi Surface Cleaner, but we don’t have any mildew. Just a little dirt every now and then. I throw the bedding for each bed into one of the zipper bags that allow you to squeeze out the extra air, then stack them on top of one another when closed up. Question – the beds are such an odd size. Did you sew/modify your bedspreads and sheets to fit so nicely on your beds? Mine are always bunched up on the edges as there is not really room to tuck under. We have just welcomed a 2007 Jayco 1006 to the family. I think I can unzip and remove the mattress covers (heaven help me trying to get them back on) and seat cushions, but from what I can see on the jack knife sofa, the cushions aren’t “removable”. I see nuts and bolts from the little section that I can see. Any ideas or suggestions for removing and washing? I haven’t heard of anyone removing the jack knife sofa covers to wash them. I only hear of them tearing them apart for reupholstery. I’m actually not sure if they are removable… You’ll have to let me know what you figure out. I’m wondering if you use the all-purpose cleaner on the inside of your canvas or if you use the woolite? Do you just use a kitch sponge? Our new (to us-2005) needs a bit of a scrub on the inside of the canvas and I’m not certain how to do it correctly. We have always just used sponges and 303 Multi Surface Cleaner. That has always worked well for us. When the dirt is a little heavier, I sometimes use a Magic Eraser type sponge, but be careful with that. It can sometimes make the fabric pill a bit. Thank you so much for all the info you give to all of us! We are new to this pop up thing, we bought ours last spring and although we cleaned it, all the maintenance of it had been done. Thanks to your posts, I feel like I have the know how to get it done. We are going to be starting our remodel this spring too (surprisingly my husband’s idea while we were looking for our pop). I have a 2001 Santa Fe, which is new to us (well, we’ve had it for a year). I’d like to wash or clean the mattress covers (the green ones). Have you done that? The manual only talks about spot cleaning and there are no care tags on them. Do you know if they are safe to wash or more of a dry clean only? I haven’t washed them myself, Eric, but you should be okay if you wash them in cold and air dry them. They may be a little tough to get back on, though. We recently purchased a 2005 Palomino Yearling. I would like to clean the inside of the camper but want to do it correctly. You mentioned using woolite initially in your post. Did you just mixed the detergent with water and wipe everything down with a sponge? My husband and I just bought our first pop up camper (2012 Jayco 1207) and can’t wait until we go camping (hopefully within the next month). I am so glad I found your site. I haven’t given the inside a good cleaning yet (the previous owners kept it spotless) but am glad that you posted the products you use as it seems they work well. Also like your color scheme – ours is dark brown and I want to lighten everything up. 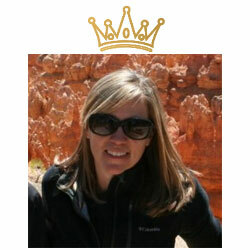 So glad to have found your site! !